A few apparent Nanosolar Utility Panel mechanical failures were observed. 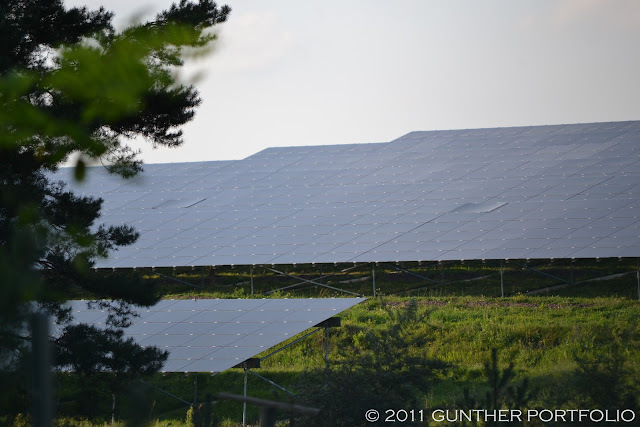 Last year in Nanosolar Summer Solar Speculations, I was wrong to doubt a photo showing further progress on the 1.1 MWp (MegaWatt-peak) solar farm located in Luckenwalde, Germany. With the return of EU PVSEC to Hamburg, a side trip outside of Berlin was once again on my agenda. Arriving at the site late on a humid afternoon, I expected to take a few photos and move along. As I hiked back via the public trail surrounding the retired landfill, I noticed a few PV (photovoltaic) modules were concave instead of flat. I managed to capture three such modules in the photo below. 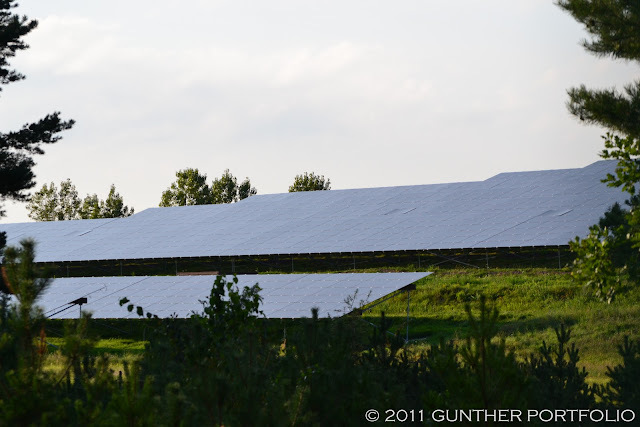 After those, I noticed more concave modules during the visit and reviewing my photos later. So the root cause of the failures may simply be defective preproduction Nanosolar Utility Panels. Since the Nanosolar GmbH module factory is maybe a kilometer from the PV plant, damage during shipment is less plausible outside of packing, loading, and unloading. A simple rule of thumb applies to frameless glass/glass PV modules; the bigger the glass, the higher the probability of glass damage if the modules are not handled in compliance with manufacturer specifications. Nonetheless, Nanosolar touts their 2.00 square meter modules as a technology advantage over industry leading thin film modules at 0.72 square meters because of reduced mounting materials. Multiple people may be required to carry the panel. Do not stand on, drop, scratch, or allow objects to fall on solar panels. Never pull, carry, or orient the solar panel by its cables. Handle solar panel only by the glass. Never leave a solar panel unsupported or unsecured; store inside shipping pallet until ready for installation. If a solar panel falls and glass is broken, the solar panel poses an electrical safety hazard and can neither be repaired nor used. Any solar panel with broken glass poses an electrical hazard and must be replaced immediately. In particular, the last point does not appear to have been followed thus far at the Luckenwalde 1.1 MWp landfill plant. 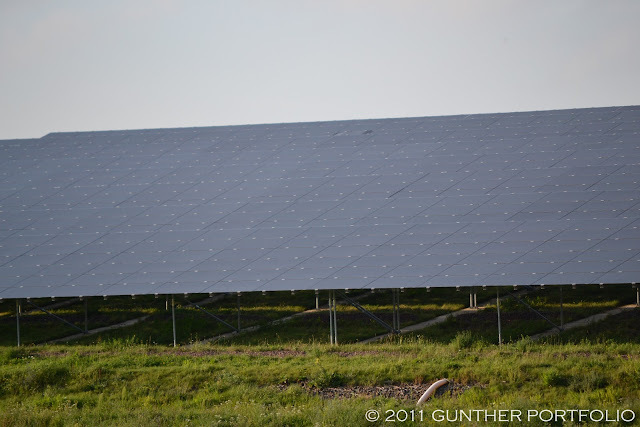 BELECTRIC, previously Beck Energy, completed the installation in June 2010 after about 18 months of delays in the delivery of CIGS (Copper Indium Gallium diSelenide) modules by Nanosolar. Use only solar panel mounting clamps tested and approved for use with Nanosolar solar panels. Mounting clamps must have polymeric (elastomeric) elements that completely contact the indicated panel surfaces. A bow (<27mm at 2400 Pa) at the panel center will not affect panel function; panels can be mounted as described below. For systems that may experience heavy snow loads (2400 – 5400 Pa), two rails with elastomer pads must be used on the same spacing as that used for the clamps. Unapproved clamps or clamps screwed on too tightly could explain the damaged PV modules as well as improper installation of the two (2) back rails for snow loads. Another speculation involves mounting structure tensions caused by the sloped ground at the former landfill. However, it’s hard to imagine BELECTRIC, the top ranked 2010 Global PV Systems Integrator by IMS Research, not following the Nanosolar Mounting guidelines. As a Nanosolar investor and project partner, BELECTRIC is almost certain to have helped Nanosolar write the technical note. Shipping/Packaging and Handling and Installation are the greatest mechanisms of module failure in the field for these installations. Operation and Maintenance requires special attention to prevent externally caused damage to modules by maintenance crews and rocks kicked up during mowing. Both Nanosolar and BELECTRIC were mum in response to my inquiries on the matter. 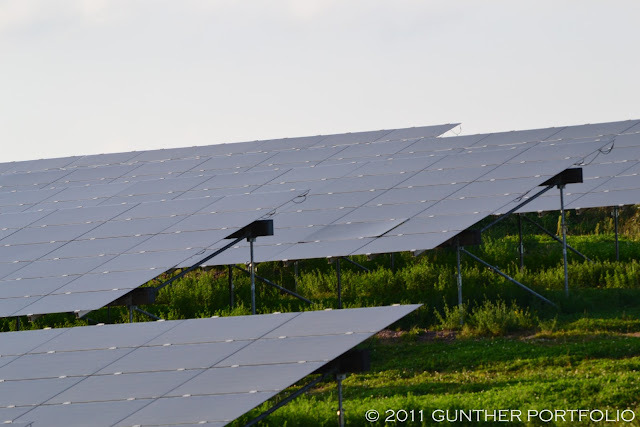 In 2011, EDF Energies Nouvelles is building a 3 MW test installation in Gabardan (France) with Nanosolar Utility Panels and another 3 MW installation in Salem, Oregon (USA). Brian Stone told me at Intersolar North America in July that many pieces of production gear were coming into the company’s San Jose cellmaking fab at that point, and that it was on track to reach 100MW cell capacity in 2012. He also said there would be some new multimegawatt projects to talk about later in the year; apparently, one of those projects will be announced in the next few weeks. So perhaps Nanosolar really has shipped sufficient modules for a few MegaWatt scale PV projects. Nanosolar’s vice president of worldwide sales, Brian Stone, said the company will be able to get its costs below those of First Solar once it doubles its factory capacity next year. To do that, however, Nanosolar needs to raise money later this year. Stone declined to say how much the company will need to raise, but said he was not worried Solyndra’s collapse would make it more difficult to secure that funding. Nanosolar is funding its solar cell factory expansion with its existing cash reserves. The company plans to reach cash-flow positive operations in 2012 without having to raise additional equity capital. But that’s Nanosolar, and the PV times have radically changed in 2011. Wow! Their 17.1%-efficient modules come not only flat but also concave? When will this farce end? Nice writeup Ed…We need this sort of thing on Fuel Cell Sites too. More $$$ at stake there, and there are plenty to see in California. Good reporting of facts on the ground like this are essential for efficient deployment of capital. Curious what journalists like you are trying to accomplish. 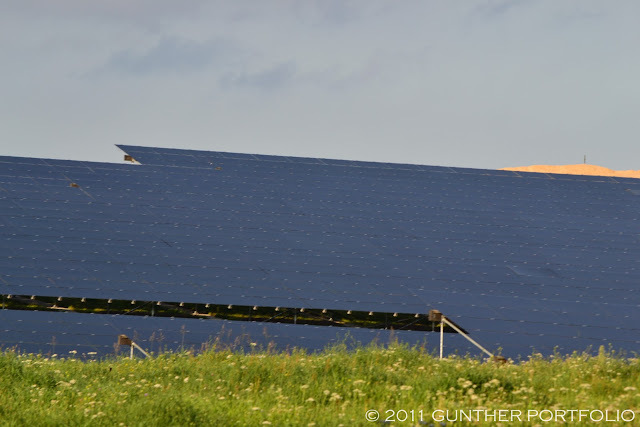 Good overview, and, as always, no PV company will get everything right at once. Nanosolar’s learning curve has been clearly quite steep taking into account all their innovations, and the recent progress in efficiency, and volume shipped (1MW/month) with expansions to 100MW capacity early 2012. Nanosolar Watcher, you sound like a Nanosolar stakeholder reciting their updated capacity expansion schedule. I thought it was supposed to be in place by 4Q11? Don’t know, not a Nanosolar employee, just give them a call. With startup experience, I know first hand that capacity expansions are not only dependent on internal capabilities and execution, but you are pretty dependent on equipment delivery schedules as well.